There are two restaurants in this world that serve up the best sandwiches – Penn Station and Earl of Sandwich. These are two places that I talk bout months after eating there and anxiously await the next time I will be enjoying these fabulous creations. There are locations where I can get a decent sandwich (Publix, Jersey Mikes) but, nothing comes close to Penn Station & Earl of Sandwich. 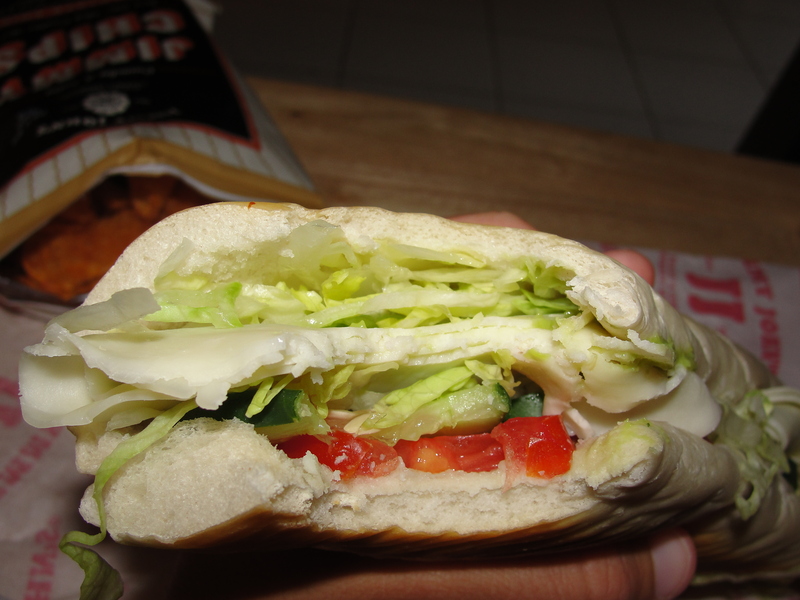 This weekend, I finally got around to trying Jimmy John’s Gourmet Sandwiches. Gourmet…really? 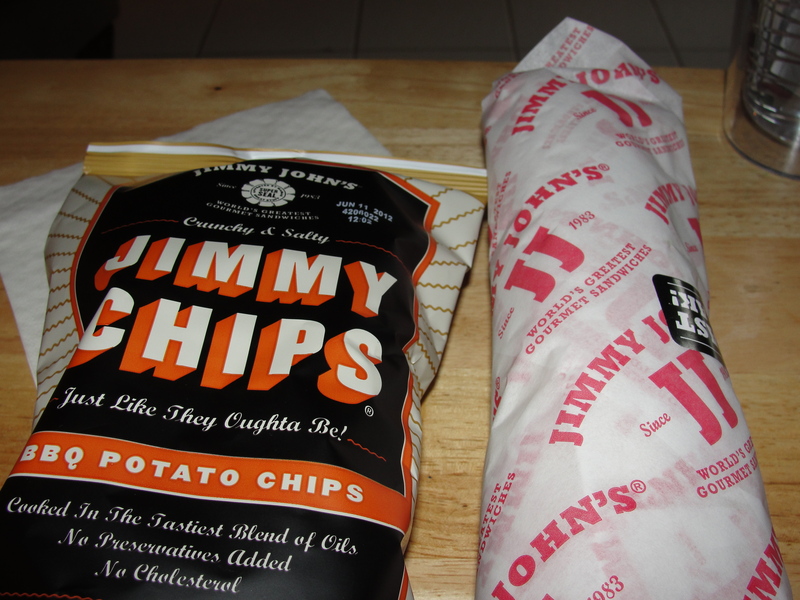 Jimmy John’s opened its first Naples location a few months back and it’s been on my list to try it. They really try to feature how fast they make the subs and even offer delivery service. 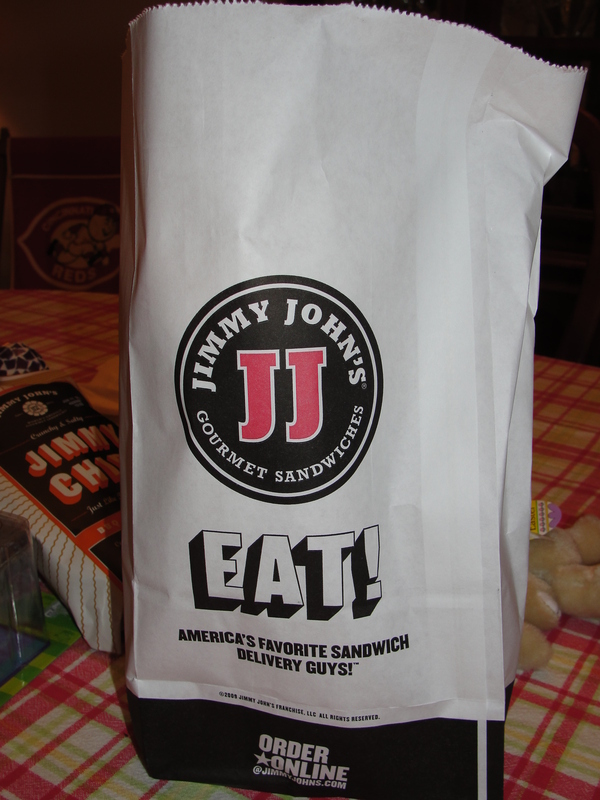 On Sunday night, I just didn’t really feel like making dinner and decided we might as well try Jimmy John’s. I arrived in restaurant to find no customers but plenty of staff working. I ordered a Veggie Sub for myself, a BLT for Mommy and a Roast Beef sub for Taylor. I also grabbed 3 bags of BBQ Chips for a grand total of $20.00. Not too bad of a price. The sandwiches were completed in a mere matter of seconds and I headed back home. Once home, I took the sandwiches out of the bag and found they were pretty small. I knew they were only 8 inch subs – this is the only choice you have unless you want it on sliced bread – but the circumference was also really small as well. Okay then. At least the chip bag felt like it was really full. I opened the sandwich and found a small piece of French bread with my veggie toppings. The sub is said to have Provolone Cheese, Avocado Spread, Alfalfa Sprouts, Cucumbers, Tomatoes, Lettuce & Mayo – I opted for no mayo. At first look, this sub did not look loaded at all. This is one of those things that really bother me. If I am only getting veggies, the least you can do is give me a lot of them. I also found from looking that there were no alfalfa sprouts! I began to eat the sub and was not overly impressed. Let us go from the outside in. The French bread tastes more to me like Cuban bread. The normal richness of French bread is not apparent at all. I do enjoy how soft the bread is and its semi-chewy consistency. The taste however, is just lacking. The next layer is the Provolone Cheese. 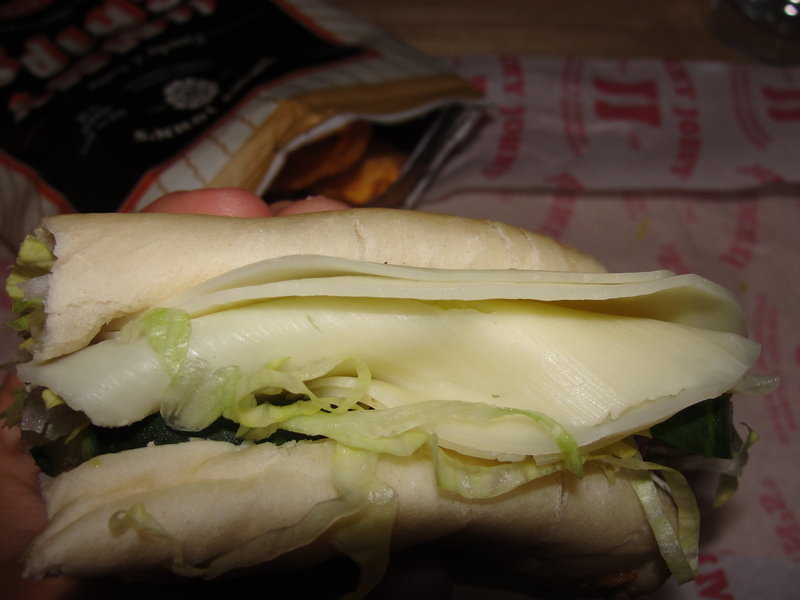 Rather than having an equal amount of cheese slices along the entire sub, most of the cheese is condensed in one area. Yes, I enjoy having my sub made quickly but, take 10 extra seconds and spread the cheese out correctly. The flavor of the cheese is very subtle but, I do like the fact that the slices are thin and deli cheese-esq. The avocado spread was there but wasn’t overly there. I got it in some of my bites and then missed it for a while. It really just tasted like mashed up avocados. I’m not sure if they added anything to it or not. If they did, I certainly didn’t taste it. I thought this would give the sandwich some moisture but, surprisingly it didn’t. There was only one layer of cucumbers on the entire sandwich. This is really a bummer because they were tasty, fresh and crisp. This also goes for the tomatoes – one layer but great flavors. As for the lettuce, I really like a lot of lettuce on my sandwich and this had an okay amount but not a great amount. The lettuce was shredded and tasted good. I looked within my sandwich to confirm that there indeed were no alfalfa sprouts. I guess fast isn’t always a good thing. Overall, the few veggies on this sandwich mixed well together. I don’t think the cheese added anything though and the bites with the extra cheese, were not good. The winning part of the meal was the chips. I opted for BBQ chips (other options were plain and jalapeño) and they were great. Cooked kettle style, these chips were so crunchy and perfectly barbequed. 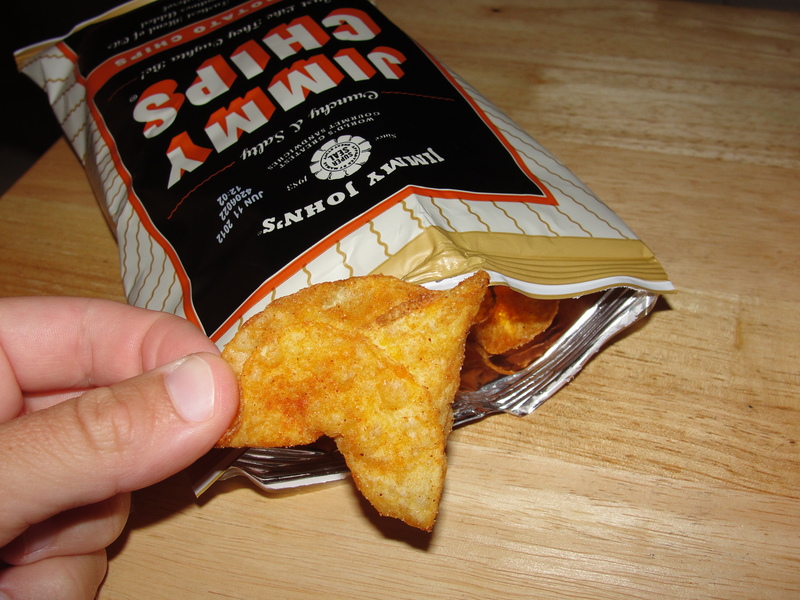 Each and every chip was great…crunchy & flavorful. 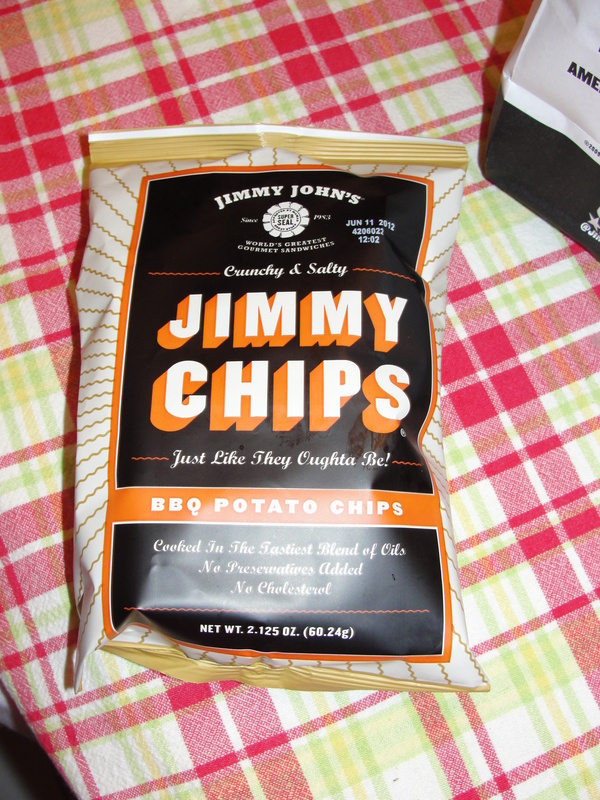 I would certainly get these chips again…no doubt. Perhaps if they would have taken just a few more seconds on my sandwich, my cheese would have been spread out and I would have had alfalfa sprouts. The sandwich was fine but it just wasn’t anything that great. It is nowhere close to Penn Station or Earl of a Sandwich and after eating my sandwich and chips, I was still hungry. I appreciate the fact that they want to be fast but, sometimes you just need a few extra seconds. 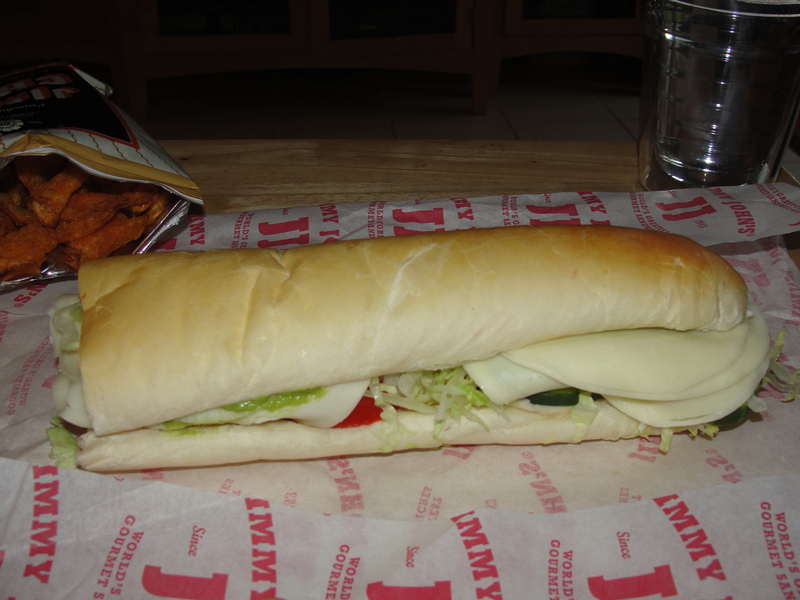 Plus, I think they should offer multiple sizes of sandwiches – this would help with the not being full thing. I won’t be rushing back to Jimmy John’s any time soon. I may visit again but, I won’t be heartbroken if I don’t. For practically the same price, I can get a foot long sub from Publix with more toppings. I think Jimmy John’s struck out with the gourmet thing. Sandwiches they may be but, Gourmet they are not.